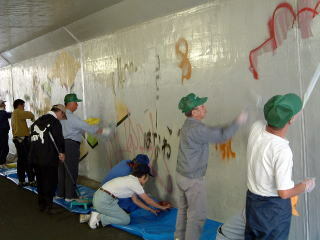 Kobayashi Laboratory conducted a painting workshop under the Hachiman Bridge Tunnel. 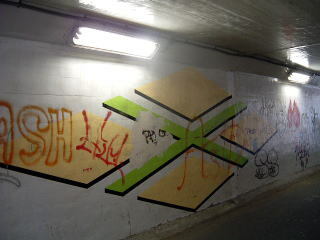 There had been numerous graffiti inside the tunnel, despite city government projects which erased and repainted graffiti. 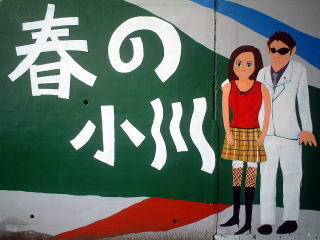 We were asked to lead the painting in September 2003. We decided to create a painting that would be unlikely covered by graffiti and would be appealing to neighboring residents. 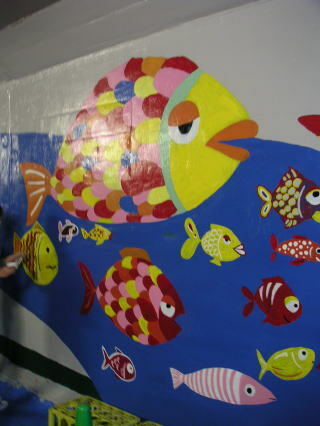 We also attempted to do the painting with college students and residents. 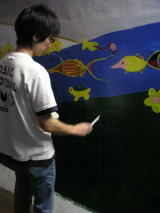 Creating mural arts in collaboration with graffiti writers and residents was our goal for truly functioning Legal Walls in Tokyo. 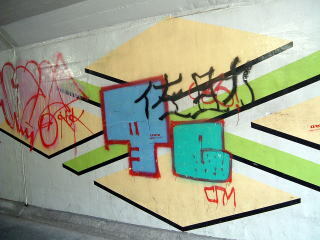 Then, we tried to do a simulation of a Legal Wall that assumed college students were graffiti writers. NPO Group June 5th and the streetscape committee members in Uehara-Fugaya District cooperated in this workshop. Students made seven basic sketches and we presented them to the neighborhood association on September 11, 2003. After the discussion, 'Stream in Spring' was chosen to be theme of the painting. 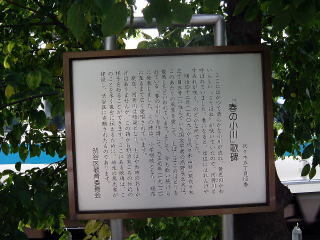 A famous school song 'Stream in Spring' was written in Yoyogihachiman, there used to be a clean stream. It now exists as a covered conduit. The first sketches by students. 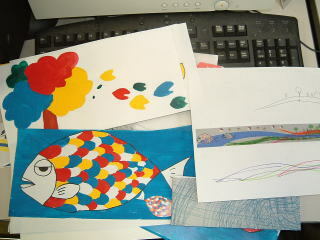 We suggested various types of paintings from ideas directly linked with the district to highly abstract images. 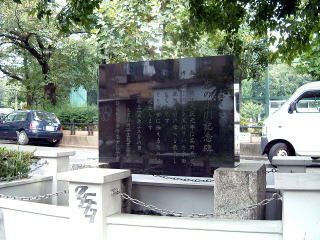 The monument of 'Stream in Spring' song is settled near the Yoyogihachiman Station. Many residents have strong attachment to this song. We were going to bring their memories back. 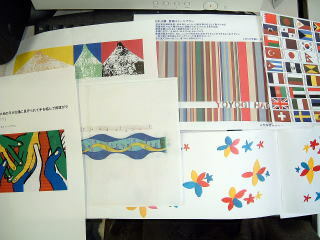 These are sketches make after the theme was decided. We attempted to make use of the length of the tunnel (22m) and create an image with a fascinating story. We also considered that we should not decide the entire design by ourselves and should leave some space for the residents. Then we asked residents and children to freely design living creatures in a stream. 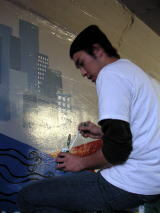 Cooperating with residents would promote more attachments to the mural and they would maintain the mural longer. 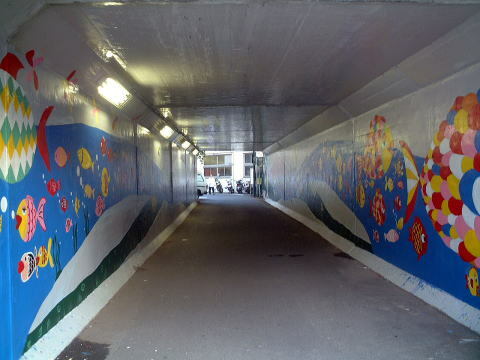 Town council members and residents of Fugaya, Fugaya 1chome and Uehara 1chome erased all graffiti of inside the tunnel on October 10th. 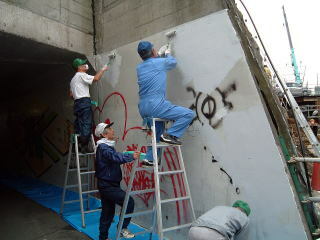 We painted the wall on October 25th and 26th. 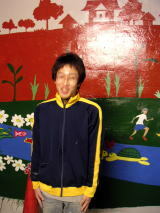 On the second day, 40 people, including 20 primary school children, joined our activity. 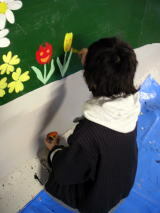 The large amount of paint was provided by Kansai Paint Co.
On the first day, we made a draft and painted the stream in blue. 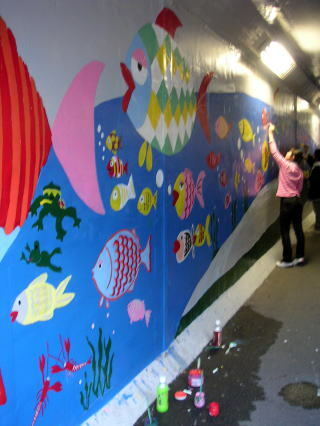 On the second day, we painted with primary school children, residents and pedestrians. They all enjoyed putting their original designed freshwater fishes into the stream. 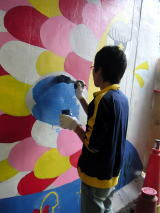 The wall was becoming more lively and colorful than we had expected. We worked the whole the day from morning to night without taking any rest. 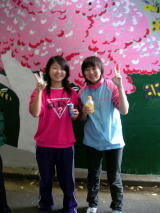 Finally, we completed the painting. The above letters mean 'Stream in Spring'. Various creatures are inside the stream. We painted them using only elementary colors because it was easy to repaint them if they were covered by graffiti. 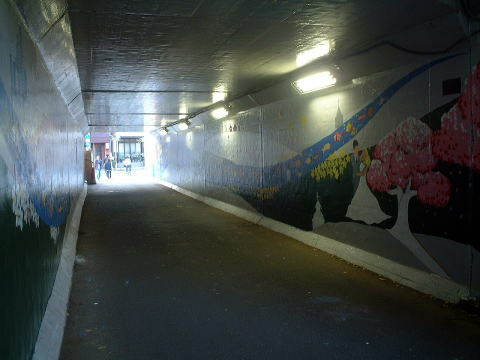 How colorful the tunnel became! It used to be so gloomy.